This is part 1 of a 2-part Webcast based on a presentation by Dr. David Whiteman on August 11, 2004 in Boulder, CO. Dr. Whiteman presents conceptual and practical information regarding winds in the planetary boundary layer in complex terrain. 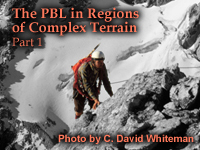 Part 1 topics include diurnal wind systems, mountain-plain wind systems, and slope wind systems. Diagrams made concepts very easy to visualise and understand! I learned a lot while studying this module. Complicated processes of mass/energy/momentum exchange in complex terrain were clearly explained using energy balance approach. The presented material was really helpful in better understanding of atmosphere/terrain interaction in mountain wind systems. The only one place in the explanations that wasn't clear to me is PBL Part 1, Section 3 (Complications), page 5 (time from 0:43 to 0:59): "... we would expect the wind during the NIGHT time to blow always from the North-East, regardless of the geostrophic wind direction (assuming that the wind wasn’t strong enough…). During the NIGHT the wind will be blowing from the South-West.” In the last sentence I think, instead of “night” was supposed to be used “day”. The night time wind conditions were already explained in the first sentence.